the compassionate deity with broad face, high cheekbones and crisply outlined almond-shaped eyes under simple arched brows joined at the bridge of the small nose, the mouth with lips together in a gentle ‘archaic’ smile, the ears with long lobes and the hair shown falling neatly over the forehead in three rounded folds, the fine-grained steel-gray stone with smoothly polished surface, the back uncarved and rough. 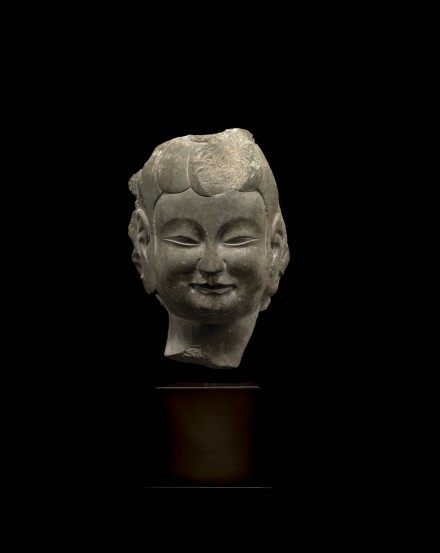 Compare the head of the standing bodhisattva flanking the Buddha in a triad group with mandorla, carved from similar stone and showing the same distinctive treatment of the eyes and the hair, discovered in the hoard of stone sculptures excavated at the Longxing Temple site in Qingzhou, Shandong province in 1996, and included in the travelling exhibition shown in Berlin, Zurich, London and Washington D.C., illustrated in the catalogue published by the Royal Academy of Arts, entitled Return of the Buddha, The Qingzhou Discoveries, London, 2002, pp. 88-89, no. 8.